You are here: Home » News » How to Choose a Suitable Plastic Granulator? How to Choose a Suitable Plastic Granulator? With the heat of the plastic recycling industry, the demand for plastic pelletizers continues to increase. Many companies also started to produce plastic pelletizers, which led to a wide variety of pelletizers on the market, with uneven quality. How to choose a suitable plastic granulator? 1. According to the user’s own actual situation and other choices of reasonable plastic granulation equipment, such as raw material supply, investment budget, power supply and water supply of the factory. 2. The user can select plastic granulators with advanced technical parameters and reasonable prices through vertical or horizontal comparison. “Longitudinal” means that the main technical parameters of the plastic granulator should meet industry standards and be examined according to industry standards. “Horizontal” is based on the comparison of the technical parameters of similar plastic granulators at home and abroad. 3. The stability, reliability, safety, and service life of the machine are an important indicator for selecting a plastic granulator. The stability of the machine manifests itself in whether the equipment structure and the auxiliary system are operating smoothly in each cycle, working under no-impact mute, and the noise must not exceed the industry standard. These conditions are related to the mechanical manufacturing and assembly precision, and also related to the rational design and structure of the plastic granulator connecting device. 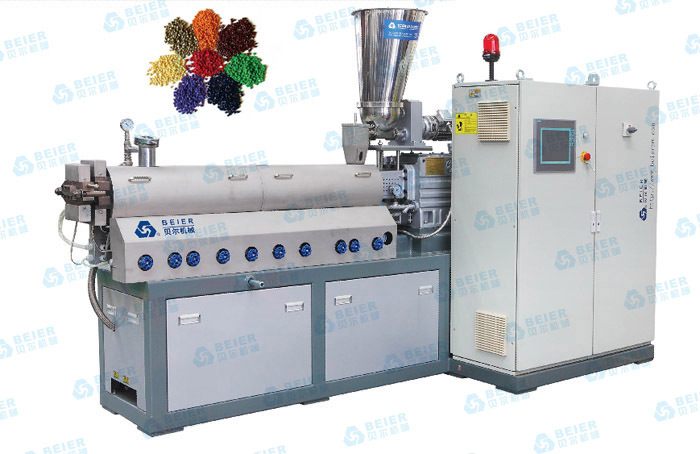 The reliability and service life are mainly reflected in the system rigidity of the plastic granulator, and related to the structure, size, material and heat treatment process of the reducer, bearing housing, screw, barrel, cross connector and bearing; Parts are the main force parts and wear parts of the plastic granulator, which directly affect the service life. The safety link of the plastic granulator is to prevent the cold start of the preheated screw and barrel. When the material of the screw does not reach the specified temperature and holding time, it is prohibited to start. Otherwise, an accident will occur. 4. The equipment must have high production efficiency, functional facilities must be perfected, and the degree of automation must be high. Beier granulator can achieve manual, semi-automatic, fully automatic operation. The high production efficiency is mainly reflected in the fact that the granulation cycle of the plastic under the normal granulation process conditions is short. This reflects the comprehensive performance indicators of a granulator’s machinery, power, and heating systems. Therefore, high-quality power sources, speed reducers, and electronic components must be used. Precise manufacturing techniques are needed to increase the sensitivity of the granulator system. The repeatability, which is a reliable guarantee for the efficient operation of the granulator system. 5. The energy saving and environmental protection of pelletizing equipment are indicators that cannot be ignored. The energy saving mainly reflects the water saving and energy saving ability of the plastic granulator compared with similar machines under the conditions of the power drive system, the cleaning system, the heating system, and the cooling system satisfying the normal process conditions. 6. The humanized design and operability of plastic granulators are also important indicators for measuring equipment quality. The plastic granulator should make its operation and management more user-friendly, the operation should be convenient, and the display should be clear and easy to understand at a glance. With parameter selection and temperature control, faults can be quickly diagnosed and eliminated, material waste can be reduced in the shortest time, and normal operation of the system can be restored. 7. Equipment maintenance and overhaul are easy and simple. Such as mechanical power source, reducer, heating system, temperature control cabinet installation location is conducive to the maintenance and repair of the machine place, and parts of the general, high degree of standardization, the market can supply at any time.